Golden Horses Development Bhd, a private company owned by Tan Sri Lee Kim Yew, is constructing Palace Residential Suite at the Mines Resort City in Seri Kembangan, Selangor, for RM600 million. The Palace Residential will offer 430 exquisite suites, adjacent to Palace of the Golden Horses, a five-star hotel with 480 rooms. Lee told Business Times in an interview recently that Palace Residential will have a seven-star rating and its facilities and services will be on par with international standards. He said Golden Horses will retain some of the suites for recurring income. It plans to rent each suite for more than RM800 a night. "We will sell more than half of the suites to locals and foreigners. We have not open them for sale yet. We are looking at an average price range of RM1.5 million for each suite. We expect some buyers to lease back their units to us," said Lee. Palace Residential will also cater to MICE (meetings, incentives, convention and exhibition) as it will have a 3,000 seating capacity ballroom, which will be one of largest in Malaysia. The biggest currently is Mines Exhibition and Convention Centre, which has space for 6,000 people. "We have started construction on the building. It will take two-and-a-half years to complete. We are on target and confident to sell," Lee said. "People believe in our projects. They know the price of our properties will appreciate as they are mostly located near a golf course," he said. The Mines Resort City, the country's first resort development, is a project initiated by Country Heights Holdings Bhd (CHHB), in which, Lee holds 48.1 per cent stake. The Mines Resort City comprises the Mines Resort & Golf Club, Palace of the Golden Horses, Mines Shopping Fair (now owned by CapitaLand), Mines Wellness Hotel, the only beach hotel in Kuala Lumpur, Mines Waterfront Business Park, Mines Exhibition & Convention Centre and Mines Wonderland. Exhibitors at The Star Property Fair 2009 at G Hotel and Gurney Plaza in Penang were pleased with the huge crowd turnout during the three-day event which they declared a resounding success. Belleview Group managing director Datuk Sonny Ho said the overwhelming response at his company’s booths was totally unexpected. “We had, since the fair first started back in 2003, suggested that it should be held at a good shopping mall so as to attract the weekend crowd. But even then, I had not anticipated such a response,” he said. Ho said the company opened up 50% of its new Bukit Dumbar Residences freehold landed property for sale and would have been happy to sell half and follow up on the rest. “On the first day itself, we already achieved our expectations in terms of committed sales, and by today, we have achieved our quota,” he said on the last day of the fair yesterday, adding that they also received good response for Phase 2 of their Palmyra Residences. SP Setia Bhd property division (north) sales and marketing assistant manager Joanne Koay said the company generated good sales and did not mind the venue of the fair as long as the crowd kept turning up. EUPE Corporation Bhd marketing assistant manager Chris Tan said the crowd at this new venue was slower but of higher quality than at the previous venue at the Penang International Sports Arena (PISA) in past years. “This turned out well as it provides us a chance to spare more time for potential buyers,” he said. Blossom Time Sdn Bhd assistant marketing manager Norita Ibarahim said they received more enquiries than expected. “The response for our The Residences @ Ferringhi Park was good, and some visitors even made the trip to the showhouse in Batu Ferringhi on the spot,” she said, adding that they also received many enquiries about their beachfront condominium project which was open for registration. Over at the ‘lifestyle’ section, Kitchentech general manager Wilson Yeoh said there was a good flow of people and it was a good chance for them to showcase their products and enhance their value. Cucina Kitchen & Wardrobe managing director T.H. Tan said the fair was always a good way to advertise and promote their products. A buyer, operations executive Ch’ng Lee Hong, 49, and her husband who only wanted to be known as Lim, 50, made an impromptu decision to buy their dream home in the form of a double-storey terrace house in Belleview Group’s Palmyra Residences project in Balik Pulau. Ch’ng said she was happy with the layout of the four-bedroom unit with two parking spaces while Lim said he was pleased with the location and trusted the developer. A buyer who only wanted to be known as Mrs Lau, 38, said she and her husband bought two condominiums, one for their own stay and one for investment. “We’ll probably stay at IJM Land Bhd’s Platino in Jelutong, while the other unit — Ideal Homes Properties Sdn Bhd’s One World 2 in Bayan Lepas — is for investment,” said the sales manager. Henry Butcher (Malaysia) Penang director Dr Teoh Poh Huat noted that the visitors to this year’s fair were more affluent, and there was a great deal of interest in subjects pertaining to lifestyle, particularly going by the large crowd attending the health talks. Where property was concerned, Dr Teoh said quite a number of new projects attracted some attention, indicating that buyers had been waiting in the sidelines for the right time and opportunity. The three-day fair, themed Modern Lifestyle, featured over 50 exhibitors occupying some 100 booths at the hotel and shopping complex. Besides checking out property, home improvement products and financing packages at the exhibition booths, visitors also took the chance to attend various talks and forums, take part in the ‘Surf, Click & Win’ and ‘Lucky Catch’ contests, and watch performances such as belly dance and a fashion show featuring various pieces of jewellery which were auctioned off by Henry Butcher in aid of the Penang Pure Lotus Hospice of Compassion and Asia Community Service. The Star Property Fair 2009 was organised by Star Publications in collaboration with Henry Butcher and supported by The Expat Group. Developers should look beyond residential projects and complement their offerings with tourism, trade and education-related developments, urged Jeff Ooi, the Penang Chief Minister’s Chief of Staff. Speaking at the Star Property Fair 2009 talk on ‘Future Real Estate Development of Penang’, Ooi said this would help upgrade Penang’s status to a truly international city. “Moreover, it would give investors more choices,” he added. He also commended developers who ensured their projects complied with the Green Building Index, as this would enhance the island’s standing as a choice residential location, at the same time lending a helping hand in conserving Mother Earth. “I hope all house buyers will insist on this being a key feature when they look around for houses,” Ooi told his audience in a packed function room. In an earlier talk, author and historian Khoo Salma Nasution briefed attendees on ‘Investing in the George Town World Heritage Site: Why & How’. She said should one decide to invest in property within the heritage area, it was important to know that there were certain constraints in place. “One has to maintain the authenticity of the buildings and understand the beauty of the old. We want people to invest with the right motivations, those who are appreciative of the cultural and historical significance of the buildings. “Emphasis must be placed on quality and not quantity of the development, so it will enhance and not degrade the value of these world heritage sites,” Khoo said. She added that conservation was the management of change, and illustrated a few examples where improper redevelopment had stripped those heritage buildings of their identity. To that end, she expressed her hope that potential investors intending to refurbish heritage buildings would take into account the architectural designs and use the right materials in order to preserve the buildings’ authenticity. As there are a number of vacant and derelict heritage buildings around George Town, Khoo encouraged investors to opt for these property and bring back their former glory, instead of going for buildings currently inhabited, as it would mean moving out the very people who form part of the city’s living heritage. The second day of talks at the Star Property Fair 2009 proved a hit with the crowds, with author and Sunday Star columnist T. Selva’s talk on ‘Indian Feng Shui – Vasthu Sastra’ filling the function room to the brim. Vasthu Sastra, Selva explained, was the ancient Indian art of placement and science of construction, architecture and dwellings to create a harmonious flow of energy within a particular space to promote the well-being of occupants. During the talk, he briefed attendees on vital aspects to consider when buying or renting a property, such as the direction the house is facing, internal arrangements, locations and plot shapes. “One should try to choose a house which incorporates the various principles of Vasthu Sastra as much as possible. The science is based on the elements of ether, fire, water, earth and air —all of which must be present in the house in harmony,” Selva said. He explained that the northeastern quadrant was suitable for water elements, thus if one wishes to place a fountain or pool, this would be the ideal location. “The southeast is in tandem with the fire element, making it the preferred location for kitchens. “The earth element is prominent in the southwest, and bedrooms or storerooms should be placed here. “When choosing a house, one should identify the direction of the main door, kitchen, master bedroom, children’s bedroom and bathroom. “For the main door, the auspicious directions in order of preference are northeast, east, north, northwest, southeast, west and south. “One should avoid southwest facing houses at all costs, as it is very inauspicious,” Selva said. In interiors, he advised people to avoid dark colours on walls, and instead opt for soft, cooling colours as the home is supposed to be a place for comfort and relaxation. In another talk, EON Bank branch managers Chiang Yuan Tyng (Bayan Baru) and Khor Chong Eya (Bukit Mertajam) spoke on ‘Creating Wealth for Generations to Come’. They highlighted the bank’s financing packages which could potentially save one thousands of ringgit on interest fees. Their affordable repayment schemes offer longer periods of up to 30 years with financing available up to 90% or 95% for selected projects. MK Land Holdings Bhd sees growth for its hotels and resorts which include Bukit Merah Laketown Resort, Taiping Golf Resort and the Langkawi Lagoon Resort this year, despite the current economic situation. Senior general manager of MK Land Hotels and Resorts, Annuar Yang Ghazali said the company was targeting total sales of RM52 million for its financial year ending June 30, 2010 and RM56 million in 2011. "As for the economic situation, we think it is already improving," he told reporters after the signing of a memorandum of understanding (MoU) between MK Land, Kumpulan Emkay and the Malaysian Armed Forces Social,Welfare and Sports Club in Petaling Jaya today. According to Annuar, Bukit Merah Laketown Resort will focus on local tourists. However, the resort has also been able to attract foreign visitors from countries such as Italy and the United Kingdom (UK). He said the participation of foreign visitors as well as locals, has enabled the company to sustain the room pick up rates of its holiday resorts. On an average, Bukit Merah Laketown has a 36 per cent occupancy and the Langkawi Lagoon Resort, 60 per cent. Meanwhile,the signing of the MoU is to promote the three resorts managed by MK Land and the Belum Rain Forest Resort under Kumpulan Emkay, among the members of the Armed Forces club. Eversendai Group said the outlook for the Middle East construction market remains bleak, though there are some market opportunities for infrastructure projects. Founder and managing director Datuk A.K. Nathan said while there are fewer jobs in the Gulf region, and competition is stiffer than before. "While the market in Dubai has slowed due to effects from the economic crises, activities are still vibrant in Abu Dhabi and Qatar. In the first seven months of the current year, we have won contracts worth RM500 million in Abu Dhabi and Qatar," Nathan told Business Times. The contracts are to build a convention centre and the Nakilat Shipyard in Qatar for Qatar Petroleum, a high-rise corporate tower in Abu Dhabi, dubbed Capital Gate, and Dubai Pearl, a luxury condominium development. Nathan added more projects are coming on stream in the Middle East worth a few billion ringgit and as such Eversendai is geared on getting more jobs. Eversendai's on-going projects include building the New Doha International Airport, a contract worth RM420 million awarded by SO JV, and the 84-storey Dubai Tower project worth RM125 million awarded by the Al Habtoor/Al Jaber joint venture. Eversendai, set up in 1984 builds steel structures that are transformed into dazzling buildings that famous architects design. The group gained recognition when it completed Tower 2 of the Petronas Twin Towers in Kuala Lumpur in 1988. Its entry into the Middle East was through the Burj Al Arab hotel project in Dubai, which it was awarded in 1995. 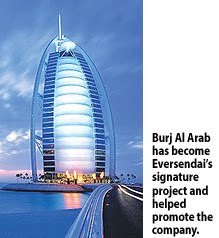 Burj Al Arab became the company's signature project and helped promote Eversendai. Since then, Eversendai has completed 50 projects in Dubai, Abu Dhabi, Bahrain, Saudi Arabia, Oman and Qatar. They include buildings such as the Dubai Mall, Rose Tower, Emirates Towers, Ski Dome, Burj Dubai, Dubai Festival City and the Qatar Science and Technology Park. JOHOR BARU: Iskandar Investment Bhd (IIB) wants to position Iskandar Malaysia’s EduCity in Nusajaya as the leading knowledge hub in the region. 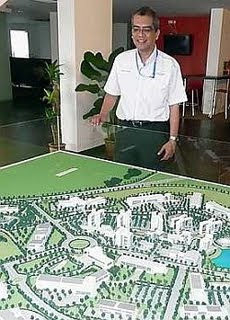 Senior vice-president (education & healthcare) Khairil Anwar Ahmad said EduCity would be developed into a unique destination offering quality but affordable higher education for locals and foreigners. “EduCity will be developed into an educational hub with the best in class faculties from reputable universities in the world,” he told StarBiz recently. Instead of just one university with eight faculties, EduCity would have eight universities with one specialised faculty each. The 21.4ha EduCity will be developed in two phases under a 10-year plan (2008-2018). Work on Phase One on 49.12ha has already started and is expected to be operational in 2013 with four universities and 4,000 students. Under Phase Two, another four foreign universities are expected to set up their branch campuses and these will double the student enrolment. Britain’s Newcastle University Medicine (NUMed) is the first foreign university to set up its branch campus in Iskandar Malaysia, which is also the university’s first international branch campus. In a media briefing in May, NUMed Malaysia Sdn Bhd chief executive officer Professor Reginald Jordan said its Johor campus would be the main catalyst to promote the state as the preferred destination for medical studies. Construction work on its RM300mil campus on a 5.26ha site has started in Nusajaya; one of the five flagship development zones in Iskandar and is scheduled for completion in May 2011. The university will offer 40 places in its initial intake and has so far received over 200 enquires from Malaysia, Egypt, India, Singapore, Sri Lanka, Europe and the United States. The first two NUMed Malaysia intakes of 40 students each will undertake the first two years of the Bachelor of Medicine and Bachelor of Surgery (MBBS) programmes in Newcastle. They will return to Malaysia to complete the remaining three years in Johor. Subsequently, from 2011, all five years of the MBBS programme will be delivered at the Nusajaya campus. Khairil said NUMed professors would be at the Johor campus and deliver the curriculum on a stand-alone basis without any collaboration with other universities. He said the medical degree would have the name of Newcastle University United Kingdom and the degree recognised by the British Medical Council (BMC). “It is very significant in the medical fraternity as BMC has never recognised any British medical schools outside Britian,’’ said Khairil. Established in Newcastle upon Tyne in 1834, the university’s School of Medicine and Surgery is currently ranked fourth in the Times Good University Guide 2009. About 700 doctors practising in Kuala Lumpur and 7,000 others in the region are graduates of the university. Khairil said it was cheaper for Malaysians to pursue medicine at NUMed in Nusajaya than in Britain. Khairil said it cost Majlis Amanah Rakyat (Mara) RM1.2mil to send one student to study medicine at NUMed in Britain. For that amount of money, MARA could sponsor two students in Nusajaya. He said IIB was focusing on certain universities to open their faculties in EduCity with disciplines that could relate with the Iskandar Malaysia’s Comprehensive Development Plan from 2006 until 2025. As such, IIB was now talking with several public universities from Australia and Europe interested to open their branch campuses offering hospitality, engineering and marine and logistics-related studies, he said. He said for the second phase, IIB would be looking at language courses, fine arts and multimedia disciplines to provide support for the creative industry which was one of the new economic pillars in Iskandar. On a move to attract one of the top China and Hong Kong universities to Iskandar, Khairil said IIB did not have any direct contact with them at the moment but if they were to come to Iskandar, IIB would encourage them to set up their branch campuses in EduCity. He said unlike commercial investors, universities took a much longer time to come and open branch campuses. While they were here not to make money, they could not lose it. Khairil said the most important issue for public universities was the market demand in terms of student enrolment and whether the revenue would be able to cover the operational cost. On the other hand, commercial investors considered several aspects such as return on investment, various risk elements and business opportunities. “When foreign universities want to open their campuses here, we help them as much as we can to provide the data and the information they need to prepare a solid business plan,” said Khairil. He said when universities decide to come, they would be here for the long term and the most important thing was to protect their brand name. SINGAPORE: Singapore will release more land for development and make it harder for home buyers to defer payments, steps aimed at curbing speculation in the housing market and that drove down property stocks on Monday, Sept 14, according to Reuters. With immediate effect, banks and developers will not be allowed to offer loans on homes under construction where the borrower need only put down as little as a 5 percent cash downpayment and defer repayment of the principal until after building is completed. Singapore's actions come as some Asian governments warn of speculative bubbles in real estate markets and said they may take steps to cool an overheated market. For instance, Bank of Korea said on Thursday it would lift interest rates if home prices climbed further. Mah's announcement in Parliament caused property stocks to fall sharply, with City Developments falling as much as 5.6 percent. CapitaLand fell 3.4 percent while Keppel Land was down 4.3 percent by 0640 GMT. "It's a tentative step... More significant would be if the government raises the 5 percent downpayment," he said. SINGAPORE: Mapletree Investments, the property unit of Singapore state investor Temasek, is poised to list a real estate investment trust (REIT) in Singapore that could hold up to S$4 billion (S$1= RM2.45) in assets, a top executive said. Chief executive officer Hiew Yoon Khong said last Friday that the listing of the REIT would take place when stock market conditions improved. "The management team is ready and the filing process is really a two-month job," Hiew said in an interview. "We were actually preparing for the IPO (initial public offering) 16 to 18 months ago, but the market turned." Hiew said that Mapletree plans to launch a Vietnam property fund and an Asian industrial property fund in the next 12 months and hopes to raise between S$500 million and S$1 billion for each. Hiew, who is also senior managing director (special projects) at Temasek, said that Mapletree's strategy was to become "a real estate capital management type of business", managing listed and unlisted funds for outside investors. He said that over the next three to five years, Mapletree hoped to grow its property assets to at least S$20 billion. SEREMBAN: Syarikat Perumahan Negara Bhd (SPNB) has successfully revived 75 abandoned housing projects, as of August 2009, at a cost of RM433mil, its chairman Datuk Azian Osman said. He said the company had received RM430mil under the Government’s stimulus package to revive abandoned housing projects nationwide. “SPNB is reviving 10 projects, involving 1,945 houses, throughout the country,” he said after 96 houseowners in Taman Senawang Jaya (Phase 1C) received the keys to their single-storey houses from Negri Sembilan Menteri Besar Datuk Seri Mohamad Hasan on Saturday. Phase 1C of Taman Senawang Jaya was abandoned in 1984 when the developer ran into financial problems, prompting SPNB to take over the project in 2005. Work to revive the project, at a cost of RM15.3mil, began in 2007 and the certificate of fitness was obtained in May this year. Azian said SPNB was allocated a total of RM1.4bil to date to carry out people friendly housing projects. As of Sept 7, 2009, SPNB handed over 11,569 people friendly housing units, costing RM631mil, to successful applicants. The people friendly housing projects were introduced by the Government to help fishermen, farmers and the poor who cannot raise loans from financial institutions to own houses. “Besides rehabilitating abandoned housing projects and building people friendly housing projects, SPNB is also in the midst of building 35,583 affordable houses nationwide for low and middle-income wage earners,” he said. PETALING JAYA: Construction players and those in other service industries will have more time to adjust and take the necessary measures to manage their business now that the Government has deferred the Stamp Duty Act until 2011, Master Builders Association Malaysia (MBAM) said in a statement on Friday. “This deferment will help the industry grow and contribute positively to the economy as the construction sector is considered an important catalyst for the economic recovery,” it said. The Government had earlier amended the Stamp Duty Act, effective Jan 1 this year, which imposes 0.5% tax on the contract value in ordinary service agreements including construction contracts. The stamp duty rate was previously fixed at RM10. In earlier reports, MBAM said the new tax regime would result in construction costs rising by between 1% and 2% and it had asked the Government to revert to the fixed rate. On Wednesday, the finance ministry announced that effective Sept 15 to Dec 31, all service agreements would be imposed a stamp duty of RM50 and after Jan 1, 2011, all service agreements including construction contracts would be levied an ad valorem stamp duty of 0.5% of the total contract sum. MBAM said it would continue to appeal to the Government to agree to a nominal stamp duty of RM50 for all construction contracts beyond 2011.